The AMPR is a total power passive microwave radiometer producing calibrated brightness temperatures (TB) at 10.7, 19.35, 37.1, and 85.5 GHz. These frequencies are sensitive to the emission and scattering of precipitation-size ice, liquid water, and water vapor. The AMPR performs a 90o cross-track data scan perpendicular to the direction of aircraft motion. It processes a linear polarization feed with full vertical polarization at -45o and full horizontal polarization at +45o, with the polarization across the scan mixed as a function of sin2, giving an equal V-H mixture at 0o (aircraft nadir). A full calibration is made every fifth scan using hot and cold blackbodies. From a typical ER-2 flight altitude of ~20 km, surface footprint sizes range from 640 m (85.5 GHz) to 2.8 km (10.7 GHz). All four channels share a common measurement grid with collocated footprint centers, resulting in over-sampling of the low frequency channels with respect to 85.5 GHz. 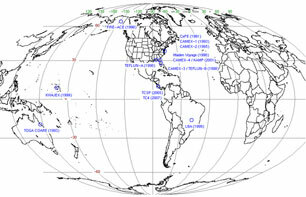 A more complete description of the instrument may be found in Spencer et al. (1994). Over water surfaces, the 10.7 GHz information delineates rain and rain-free regions with warmer TB representing increasing rain rates. The 19.35 GHz information also serves this purpose but with a smaller dynamic range than the 10.7 GHz (Smith et al., 1994). The 19.35 GHz frequency is more sensitive to clouds and ice than the 10.7 GHz. The 37.1 GHz information has a similar sensitivity to clouds as the 19.35 GHz frequency, but the 37.1 GHz frequency is more sensitive to smaller size ice. At 85.5 GHz water vapor, clouds, and smaller ice are very noticeable. In general, land surfaces and rain are radiometrically warm while the ocean is radiometrically cold due to their respective microwave emission properties. Precipitation-ice may also appear as a radiometrically cold signature for a given frequency because ice tends to scatter upwelling microwave energy out of the instrument field of view unless the diameter of ice particles is small compared to the wavelength. See Wilheit et al. (1977), Wu and Weinman (1984), Wilheit (1986) and Spencer et al. (1989) for further explanation.